Alcohol Prohibition as a U. S. policy started in 1920 in order to try and deal with alcohol-related social issues on a national scale. 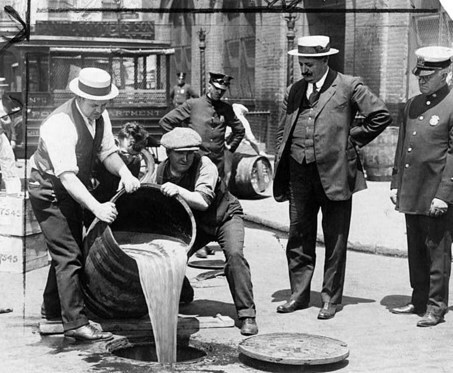 In fact, alcohol prohibition in the United States started much earlier. In 1629, the Virginia Colonial Assembly put forth some rules on excessive drinking, "Ministers shall not give themselves to excess in drinkinge, or riott, or spending their tyme idellye day or night." In 1633, the Plymouth Colony ruled that the sale of spirits "more than 2 pence worth to anyone but strangers just arrived" would be prohibited. Temperance Leader Lucius Manlius Sargent tried to get secondarty schools, colleges and universities to eleminate all references to alcoholic beverages in ancient Greek and Latin texts. Because the temperance movement taught that drinking alcohol was sinful, it was forced to confront the contrary fact that Jesus drank wine. Its solution was to insist that Jesus drank grape juice rather than wine. Dr. Benjamin Rush published his "Inquiry into the Effects of Ardent Spirits Upon the Human Body and Mind" which outlined the diseases of the body and mind associated with drinking distilled spirits. Rush said the symptoms of excessive drink included, "unusual garrulity, unusual silence, captiousness ... an insipid simpering ... profane swearing ... certain immodest actions and certain extravagant acts which indicate a temporary fit of madness." Father Theobald Matthew of Ireland toured the United States preaching of temperance and total abstinence to approximately 600,000 persons in 25 states. His calls to action had the blessing of the White House and the Senate. A number of states passed prohibition laws including Oregon, Delaware, Maine, Ohio, Illinois, Rhode Island, Minnesota, Massachusetts, Connecticut, Pennsylvania and New York. These laws were all shot down by the veto from the governors, repeal by the legislatures and invalidation by the state supreme courts. Prohibition was fueled by anti-German sentiment from World War I and moving into the WWII as well. The Temperance Movement started associating German beer with a conflict in patriotism. The Wartime Prohibition Act was passed in 1918. Also, in 1918, the 18th Amendment to the Constitution was ratified prohibiting the manufacture, sale, transportation or importation of alcoholic beverages in the United States. when Prohibition was in full force the institution of the speakeasy replaced the institution of the saloon. Bootleggers proliferated, illicit distilleries bloomed, foreign rum-runner appeared, government warehouses were raided, federal agents were killed and the courts were overwhelmed with liquor violation cases. The U. S. government had not anticipated such a huge backlash to the prohibition laws. The experiment of an alcohol-free culture evaporated 13-years later. Congress officially adopted the 21st Amendment to the Constitution repealing Prohibition on December 5, 1933. Let us come before His presence with thanksgiving;Let us shout joyfully to Him with psalms. [A Psalm of Thanksgiving.] Make a joyful shout to the LORD, all you lands! Enter into His gates with thanksgiving,And into His courts with praise. Be thankful to Him, and bless His name.